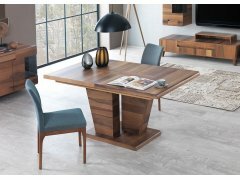 The RoomSmart’s Keyfex collection has combined the traditional look of walnut veneer with very untraditional and intriguing geometric patterns and abstract design used in their dining table and coffee tables. These are the pieces that make you say “Wow”! when you see them. From a glass-topped whirlpool inset into one circle of a three-circled coffee table top to another coffee table that divides into six segments for entertaining, you will see both stunning beauty and clever function combined in an eclectic piece that will be the focal point of any living space! The use of creating variant shades of walnut veneer adds another element to the design, making even the most basic table shape pop with interesting dimension and pattern! Whether you’re entertaining family, friends or business guests, everyone is sure to be gathered around either your dining table or your coffee table for appetizers and meals, and these are visual focal points in your home that send a silent and positive message that you’re innovative and sophisticated, and unafraid to be different! Enjoy taking a look at the wonderfully unique styles of the Keyfex Collection! CONTEMPORARY STYLE: Eclectic walnut veneered table has sleek, streamlined appearance that blends with most home décor styles.TOP GRADE CONSTRUCTION: Premium MDF boards, with heavy-duty hardware provides a table that is durable and sturdy to use, and will be beautiful for years with normal wea.. UNIQUE GEOMETRIC SHAPE: Taking its inspiration from the dodecahedron, this coffee table provides an eclectic, and very unexpected look for your home!UPHOLSTERED TOP: Premium upholstered top can be wiped clean with a damp cloth, and adds a neutral beige color that blends with any home color sc..